I don't like my current office chair, but I don't want to spend a lot of money on a new one. Do I really need the Vert? We get it, a lot of us have to buy our own office chairs these days. If you want more supportive seating that doesn't break the bank, the Vert Ergonomic Office Chair is a great office chair for you! 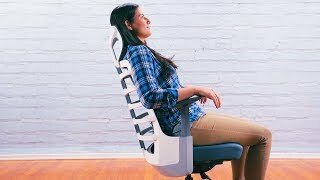 We love the Vert's ergo-friendly features like adjustable lumbar support, head/neck supporting headrest, and flexible mesh back, and we think you will too! Give your body the backup it needs with an ergonomic office chair that really "gets" you. You can get all of these fine ergonomic features for much less than other brand's chairs, so upgrading to a new chair won't be as painful on your wallet as you'd think. I'm having a hard time deciding between the Vert, J3, and Pursuit chairs. Which one is right for me? The Vert Ergonomic Chair was designed with a unique flexible back that twists to mimic the natural curvature of your spine. This means you can expect ideal support along your entire back and lumbar region, in addition to being able to adjust your seat depth and height more than other chairs. The seat's supportive fabric and mesh back provide comfort and breathability, making it suitable for long-term sitting sessions or humid work environments. Of course, if you have any questions about which ergonomic chair is right for you, our chair comparison chart helps simplify things a bit. What features make this chair so ergonomic? The Vert Ergonomic Office Chair was designed and built with the best ergonomics features in mind. From the casters to the headrest, every feature included on the Vert is there to increase your comfort levels. The back resembles the human spine, and buttresses the back throughout a wide range of seated postures. A rib design with an elastomer spine system add flexibility to the chair's back, while a back tilt lock with weight-sensing mechanism auto-adjusts the chair's recline resistance. This means the chair is much more intuitive, which saves you time and frustration not having to manually adjust your chair. Does the Vert come with a mesh seat? No, the Vert comes with a plush seat cushion and a mesh back, so if you feel a little hot when seated, this is a chair that can help improve airflow to your back. But if you're interested in an all-mesh chair with mesh seat, try the Pursuit Ergonomic Chair! Our customers love the Pursuit Chair thanks to its breathable mesh back and seat, adjustable armrests, and articulating headrest. Compared to the Pursuit, the Vert comes with a plush seat cushion that's lightly contoured to support your lower half, and a mesh back and headrest. The arms are height adjustable, like the Pursuit's arms, but the Vert's back was designed to mimic the human spine, so it fits to your body and not the other way around. If you need help choosing your chair, give us a call and we'd love to help you narrow down your choices until you find the perfect chair for your body. Can I remove the headrest on the Vert? No, the Vert's headrest is not removable after initial assembly. If you'd rather work without it, you can opt to not install it to the chair, but doing so will leave two holes exposed on the upper part of the chair's back. We recommend installing the headrest for this reason. How contoured is the seat? The Vert Ergonomic Office Chair's seat is lightly contoured for comfort. What is the Vert's weight capacity? This ergonomic chair was designed to hold up to 250 pounds, which makes this a suitable seating option for most of the population. What's so special about a mesh back? A mesh back allows you to enjoy more breathability when seated thanks to the improved airflow your back receives. This makes the Vert ideal for work in warm or humid environments, or if you ever find yourself getting clammy in your office chair, the Vert can make a huge difference in keeping you cool while seated. Sit back and relax in comfort and style with the Vert Ergonomic Office Chair, available in black or white. The sleek black version of the chair features gray armrests and a polished silver base. For a chair that pops, try the white version. The white chair features a bright white back, gray accents, and a matte silver base. The backrest of both versions is a dark gray mesh. Your office mates will compliment your new chair, as well as your better seating posture. Sit back and feel the difference in a chair that moves with you, with the Vert Ergonomic Office Chair.